The Upton PTO held a week-long celebration last week in recognition of Upton teachers and their great contributions to education and the community. The students and parents had an opportunity to show their appreciation for the hard work their teachers do and the long hours many of them put in. 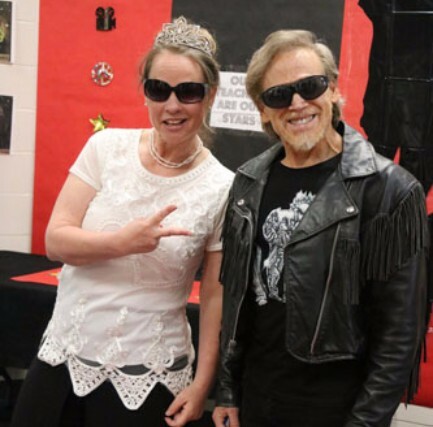 The PTO organized a “Hollywood” theme for the week,and gave teachers some red carpet treatment. Parents brought in meals each day for the lounge, and posters were hung on the wall of the famous teachers, as well as, special notes written from the students. 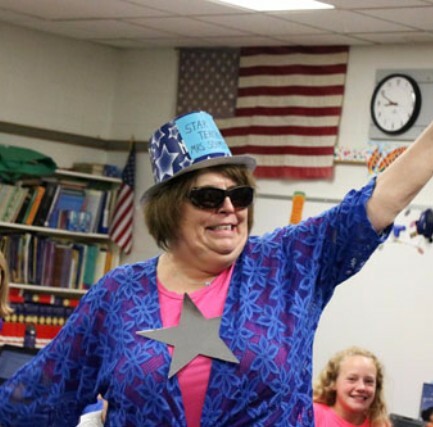 Wednesday, was dress-up day,and the PTO gave away prizes and gift cards to the winning teachers. Middle school English teacher, Michael Patterson,won the best-dressed award for this year’s contest. It was a great, well-deserved week for Upton teachers, and the PTO would like to thank it’s volunteers for many hours of work putting this event together, and once again thank the teachers for another great school year! Volunteer dads for this year’s PTO “Muffins for Moms” event last Wednesday were: Justin Mills, Loren Barritt, Cody Barrit, Dennis Stirmel, and Nick Johnson. The event was attended with almost 300 students and their special quests being served. The moms enjoyed a morning of breakfast, refreshments, and some special time with their kids, and the students enjoyed having their moms visit the school. 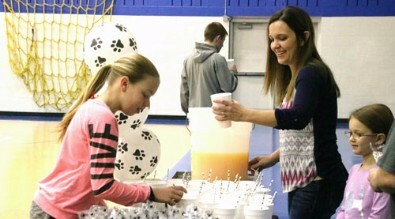 PTO volunteer, Gina Barritt and daughter, Whitney, help serve breakfast to the 3rd through 8th grade students at Upton Elementary during the students’ first week of PAWS Testing March 8th. Joes Food Center helped donate the food for the event. Proficiency Assessments for Wyoming Students (PAWS), is the official statewide assessment used to measure individual student achievement against the Wyoming content and Performance Standards for 3rd-8th grade. Students will be testing through the end of March.